Trump has a middle schooler's approach to foreign affairs — and it will make the United States weaker and less able to lead as a result. Talk about a false choice. It’s not particularly original for Trump to warn of the creeping threat to American sovereignty of global institutions. This trope has been a standard of a certain breed of American politician for decades. I served on the Senate Foreign Relations Committee staff in the 1990s when its then-chairman, Sen. Jesse Helms, launched an all-out assault on U.S. funding of the United Nations. In the years since, more than one Republican presidential candidate in has flirted with actually withdrawing the U.S. from the world body, claiming that it poses a threat to American sovereignty. This idea is poppycock, but that doesn’t mean there aren’t people who believe it. Setting up participation in international institutions as the opposite of patriotism is the ultimate straw man comparison. The United Nations and other global institutions are easy to criticize, and they often deserve it. Bureaucratic inefficiency, corruption, and the way they have provided an outsized voice for rogue nations can make these bodies hard to defend. The need for reform is clear. There are also obvious downsides to globalization; some countries, including the United States, have watched jobs and industries migrate overseas and found global problems like terrorism, transnational crime, and public health crises harder to manage. These problems have made global organizations with so-called global solutions easy targets for a certain kind of nationalist ideologue. But setting up participation in international institutions as the opposite of patriotism is the ultimate straw man comparison. It confuses the shortcomings of such bodies with the devaluing of their intended missions. It casts organizations that we need to make us safer and more prosperous as threats to U.S. sovereignty. And it ignores the last 70 years of history, when such international institutions served to safeguard and advance American interests far more than anyone else’s. Trump was specifically critical of the U.N. Human Rights Council, from which the United States withdrew this year, and the International Criminal Court. Both are highly problematic organizations. Neither poses the remotest threat to the United States, as administrations of both parties have worked to ensure over the past few decades. But Trump’s criticism, lacking any proposal for an alternative structure, symbolizes an about face for America on universal human rights standards, an area in which we once led. It also ignores the ICC’s limited successes, like the its bringing a measure of justice to Balkan war criminals. Human rights abusing regimes like Russia and China, and Burmese war criminals slaughtering the Rohingya, are celebrating Trump’s approach. That’s not patriotism; it’s weakness. Further, the demonizing of “globalism” has become a convenient excuse for the United States to shirk other responsibilities. In his speech, Trump defended the U.S. withdrawal from a global compact on migration. Today, when there are more refugees on the move than at any time since World War II, only international efforts can prevent destabilizing conflicts from spilling across borders and destroying lives. Yet the United States is closing its gates, taking in only a fraction of the refugees it did just a few years ago. That’s not patriotism; it’s shortsighted cruelty. The demonizing of “globalism” has become a convenient excuse for the United States to shirk other responsibilities. Ignored in the speech, but clearly relevant in this context, is Trump’s withdrawal from the Paris climate accord. A global crisis involving sea-levels rising and superstorms and droughts expanding cries out for U.S. leadership. But buying into the myth of reduced American sovereignty, Trump walked away. That’s not patriotism; it’s burying your head in the (increasingly hot) sand. Trade is where Trump’s true passion for tearing down global institutions is most evident, despite the tremendous prosperity the United States has achieved under current rules. Pressing other countries to further open their markets is fair, and greater support for affected U.S. workers is reasonable. But Trump’s approach of throwing up protectionist walls and launching trade wars will fail. That’s not patriotism; it’s fear of competition. Trump’s speech suggests no knowledge of history. In that sense, it aligns with his broader approach to international affairs: He talks down NATO, shames partners like Canada and Germany, attacks international cooperative bodies like the European Union and the World Trade Organization and cozies up to autocrats like Russian President Vladimir Putin and praises groups like Poland's ruling Law and Justice Party, which is rolling back democratic norms. In every case, it is the opposite of the approach that has served U.S. interests for decades. But that’s Trump. He genuinely wants to tear down longstanding structures and norms: Freer trade, universal human rights, standing with allies. 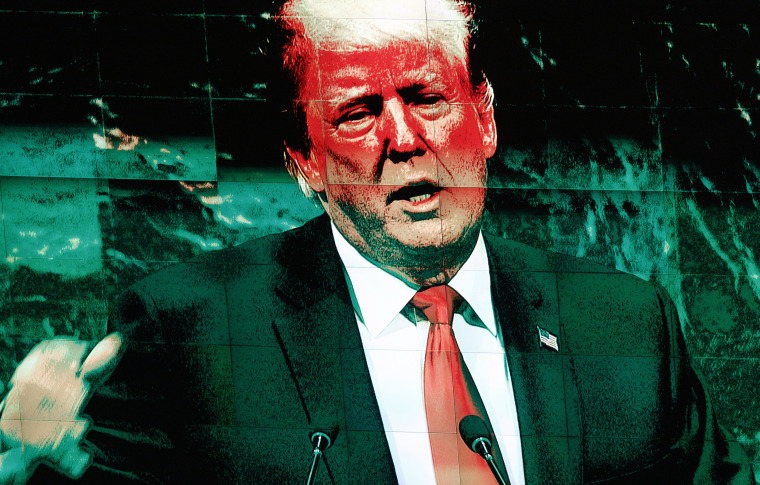 Whether influenced by aides like Stephen Miller or Steve Bannon, or drawing on his own ill-informed views, Trump believes that America should go it alone, that alliances and agreements weaken us, that values have no place in foreign policy. It's an immature middle schooler's approach to foreign affairs — machismo and selfishness that mask hidden insecurities. And it will make the United States weaker and less able to lead, because fewer will follow. America doesn’t need to fear and shun the world to have a distinct identity. It can be proud and confident while also using the structures we have built to rally others to our cause and advance our interests. Such an approach does not cede our sovereignty but does understand that fulfilling our international responsibilities expands American influence to our own, and the world’s, benefit. That’s patriotism.